A look at our 2018 tour - New York, Philadelphia, and Ottawa! The final day has finally come, and it was definitely full of love, hugs and tears. 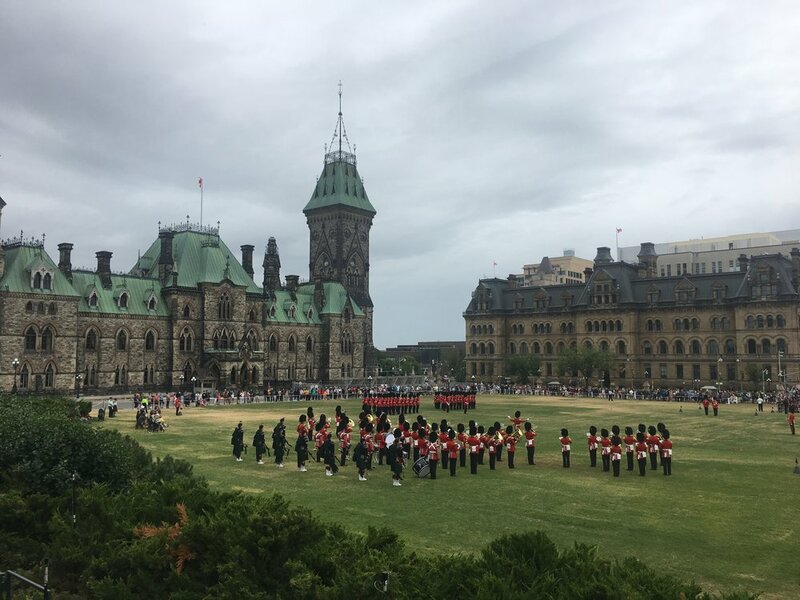 We began the day with a tour of downtown Ottawa (where we got caught in the rain - not as bad as the rain in Philly though) and we witnessed part of the changing of the guards! The rain stopped and the sun began to shine as we made our way to the Capital Ukrainian Festival for the final day! Our final performances were passionate and well received. Afterwards, members of the audience came up to take photos with us! Before our final set, we danced to the sounds of Edmonton band, Euphoria! 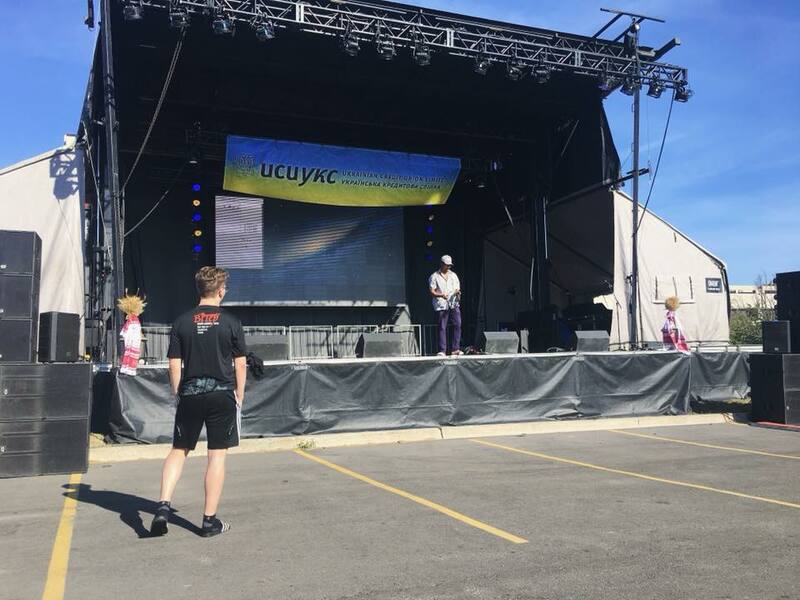 It was great having fellow Edmontonians at the festival. Finally we were lined up backstage for the last Hopak of the tour, and for some members, the last Hopak of their "Viter career." Smiles, hand holds, and winks were shared as Viter entertained the audience with a flawless performance, yet again. As we called out the final "HEY!" tears were running down our smiling faces as we knew the tour had come to an end. Backstage was full of group hugs and well wishes to those leaving us this year. We made our way to the Shevchenko monument and took one last group photo, as well as yelled out a few bud'mos. We enjoyed a free evening where some members went out for celebratory dinners and explored downtown Ottawa for one last time. Early Monday morning, members of Viter made their way to the airport for their journey back to Edmonton. Some members stayed in Ottawa, went to Toronto, or made their way back to New York to take in more sights. Safe travels to all those who extended their trip! Thank you to everyone who helped make this tour possible! A special shout-out goes to our "tour team" - Tamara, Leanna, and Nicole! These 3 did so much to help make this tour a success and we could not have done it without them. As our tour comes to an end, we look forward to another year of song, dance, laughter, smiles, and Viter love! Будьмо! Check out our Facebook page for more photos from #vitertour2018! An early morning tech rehearsal at the festival helped start off day 8 of our tour! We were then given some free time to explore downtown Ottawa, where a few members of the choir sang "O Canada" on Parliament Hill in 3 different languages - Ukrainian, French, and English! Some members spent time in the market, bought souvenirs, or enjoyed delicious Beaver Tails! We then made our way back to the festival for another performance! After performing, we received many compliments from the audience about our energy, emotion, and presentation. They especially loved our "Vyazanka" ensemble piece! Many people were dancing and singing along to the sounds of Viter. Some members ventured back to the festival grounds for the zabava on Saturday night, and handed out Viter tattoos to those attending the festival! Soon there were many people proudly sporting a Viter tattoo at the festival, even some of the volunteers had them on! Viter definitely left a lasting impression on the crowd. The day started off with an early morning departure from Philadelphia to Ottawa fir the Capital Ukrainian Festival. The ensemble took advantage of the 7 hour bus ride to catch up on some sleep, proving that Viter could be quiet for more than a few minutes! Following a long wait at the border, we arrived back in Canada! After a quick check in at the hotel and a chance to freshen up (we had 20 minutes to become show ready), we were on our way to make our debut at the festival! The choir was first up at the Folk Stage and, as usual, captivated the audience with their music. Choir members sold CDs throughout the festival (email admin@viter.ca for your own copy of a Viter Folk Songs CD or Koliada CD) and handed out tattoos to those attending the festival. As the night turned to dusk, "Hey Sokoly" and "Hopak" were performed, as well as a few choir songs on the main stage. Viter definitely "wowed" the audience as we had not one, but TWO standing ovations at the end of Hopak. It was a phenomenal start to the festival weekend. We are excited to see what day 2 has in store! Show day! The eagerly anticipated show in Philadelphia has finally arrived. A long afternoon of tech made for an incredibly well received show! We could not have put on such an amazing show without our wonderful tech team - John from "Clear Sound" and Phil from "Kleinlife Theatre" - Щиро вам дякуємо! Both choir and dancers were flawless in performances, and the audience members were in awe with comments such as, "Viter captivated us with their energy!" Another дякую goes out to our friend Victor, who helped make this show possible by helping promote it in Philly! As well, his mother treated us to a cooler full of post-show goodies (including delicious marinated tomatoes)! Here are some photos from the show that capture the spirit that is Viter! 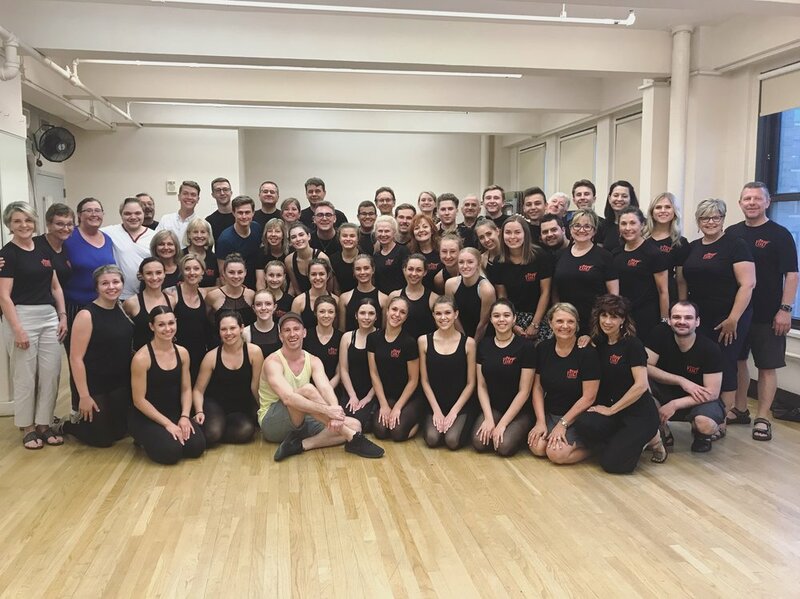 Day 5 began with rehearsal at the "Ukrainian American Citizens of Philadelphia" building, where we began to warm up our voices and bodies to be ready to sing and dance! Check out Facebook and Instagram for some videos! Our handsome dancer boys at rehearsal! We then boarded the bus and made our way to the "Philadelphia Museum of Art" to visit the "Rocky Stairs," where many Viterites ran up the stairs to the tune of the Rocky theme song. There was free time to explore the city, have a rest, and get ready for our meet & greet with Dzvin and Prometheus. Choir taking selfies at the Rocky Stairs! The male choruses hosted us at the Ukrainian Community Hall in Philly with food, drinks, and song. After a quick rehearsal of the combined song, Kolo Mlyna (which sounded amazing!! ), we enjoyed a nice meal together. At the event, a beautiful cake was created to welcome Viter to Philadelphia. Thank you for making us feel so welcomed! The beautifully crafted "Welcome" cake! Can you tell Viter loves selfies? Viter's Lesia and Sam with our new friends! Viter dancer, Kalyna Gunderman, celebrated her 18th birthday today! Naturally, in Viter fashion, we treated her to a beautiful Mnohaya Lita as a full cast (Viter, Dzvin, & Prometheus). Tomorrow marks the start of our performances on tour! We eagerly await to showcase our Canadian-Ukrainian culture, as well local talent, to the audiences in Philadelphia! Day 4: To Philly We Go! To Philly we go! After playing Jenga with the suitcases (we picked up a few extra passengers), the Viter ensemble was headed to Philadelphia. 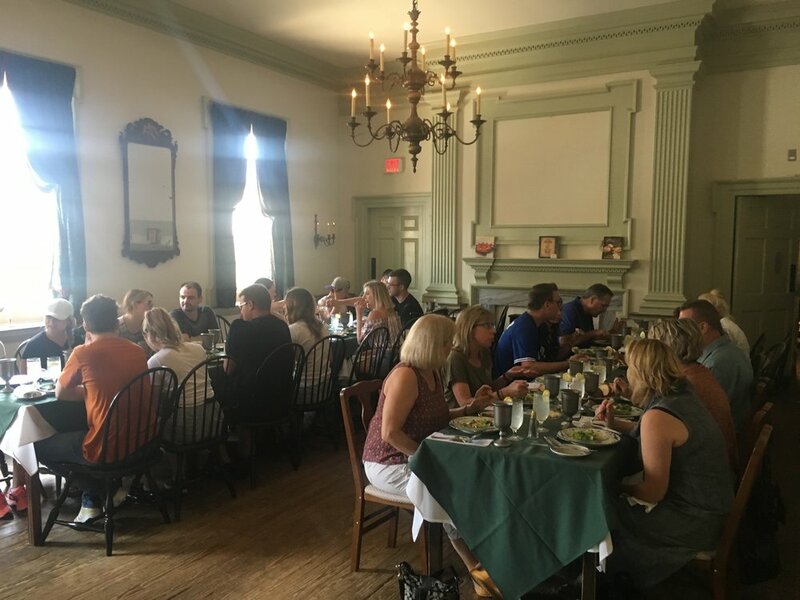 Once we arrived, our lunch destination was the "City Tavern," where we enjoyed beef pie turnovers, chicken, trout, and creme brulee for dessert! The building where we dined, hosted many important and historical meetings and celebrations of America's past. Following the meal, our city tour, led by Jack, began! 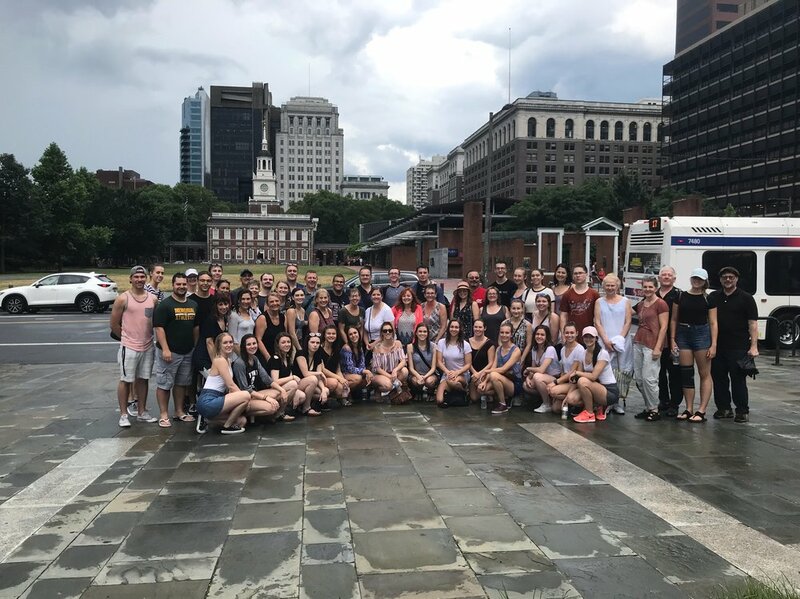 The first and second banks of the United States, Independence Hall, and the Liberty Bell were only a few among the significant pieces of history we had the opportunity to see. Suddenly, the tour took a rapid turn... the wind picked up, the rain began to sprinkle, and quickly after, the rain began to pour! Some Viter members ran for cover under trees, while others took the opportunity to perform the "Anastasia" piece learned the previous day in the torrential downpour. Unfortunately, there was no safe area for the Viter ensemble to hide. Everyone became drenched. However, we continued through with many laughs, as this will be a city tour we will never forget! Viter after the rain had passed! Once the tour was complete, we headed to check-in to our new hotel "Embassy Suits- Hilton Honors". After settling in to our beautiful spacious rooms, the choir began their rehearsal in the lobby, while taking advantage of the hotel happy hour. Choir rehearsing in the lobby! Now we are excited to begin the performing portion of the tour over the next few days! Gooo Viter! Our third day in the "concrete jungle" began with free time in the morning to explore Central Park, or do some last minute shopping! Once Viter assembled in the hotel lobby, we were off to the East Village to see what the Ukrainian community in NYC is like. 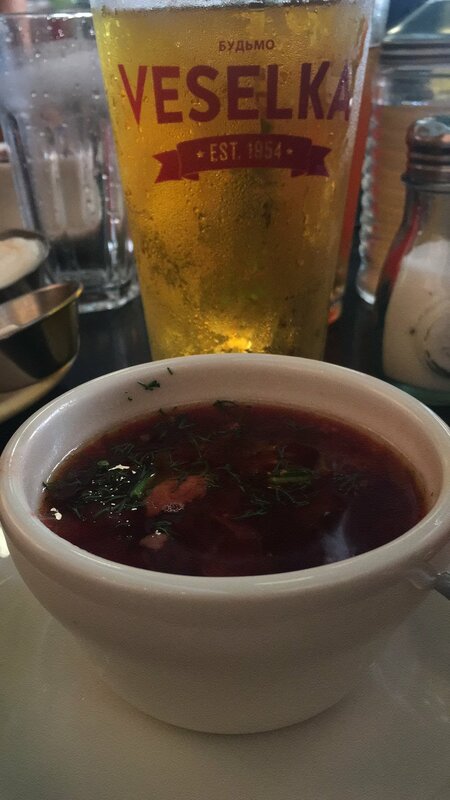 After grabbing a quick drink and singing "Гарний козак" for the locals at McSorley's Old Ale House (the oldest bar in NYC - established in 1854) just off of Taras Shevchenko Place street, we continued touring around vibrant Ukrainian community. A few Viter members that are members of Plast had an opportunity to take a photo with the New York Plast dymivka. We then had lunch at the famous Veselka restaurant, where we enjoyed borshch, varenyky, kovbasa, giant holubtsi that took up a quarter of the plate, and authentic Lvivske beer (pyvo). And what would a Viter outing be without music? We ended our meal with some beautiful songs and accordion accompaniment for the staff and locals, who were extremely appreciative. The kitchen staff even stopped working to come experience the sounds of Viter! A huge дякую to our New York friend, Andriy, for treating the ensemble to gelato! After a hearty meal, we were ready for the Broadway workshop at Pearl Studios NYC. Here we took a trip to Paris! The company learned a number from the musical "Anastasia." Not only did the dancers learn to sing while dancing, but the choir learned to dance while singing! After running the number multiple times with enthusiasm and laughs, we treated our instructors to a performance with Hopak, some songs, as well as a special Mnohaya Lita as a thank you. A free evening included a ferry ride to Staten Island, a trip to "Junior's" for some New York cheesecake, and dinner at local restaurants. Viter choir member, Mitchell Palahniuk, had the opportunity to wow the audience with his saxophone skills at "Smalls Jazz Club." Way to go Mitchell! Our time in New York has been more than memorable! We cannot wait to share our love of Ukrainian culture in Philadelphia over the next few days! A rainy start to the morning today, however the weather turned out to be perfect for the eagerly anticipated NYC tour! Places we visited included, Little Italy, Chinatown, the Ground Zero Memorial, Freedom Tower, Wagner Park (where we saw the Statue of Liberty), Wall Street, Central Park, Grand Central Station (where a few members quoted Gossip Girl), and many other sights along the way. After the busy tour full of information and historic sights, Ellen's Stardust Diner was our lunchtime destination. The talented servers provided entertainment throughout our meal with songs ranging from Jingle Bell Rock to Broadway classics. Another Viter member had a special happy birthday today too - Viter dancer, Lauren Dzenick, turned 16. The company sang Mnohaya Lita for her in Grand Central Station, where the acoustics provided an experience she will never forget! A free evening allowed members to visit different museums, walk around their favourite sights, and see more Broadway shows. We are excited to see what the rest of our time in New York has in store! Selfies in Grand Central Station! And we’re off! After an (extremely) early morning, the Viter ensemble headed from YEG to YYZ where we completed a quick connection to arrive on time in New York. Once we had a few hours to sleep, shower, and explore the rooftop patio of our hotel (Fairfield Inn & Suites by Marriott), we were off to our welcome dinner at Houndstooth Pub in Midtown Manhattan. Our choir member Melody Kostiuk received a special birthday celebration from the Viter Ensemble. There were gifts, cake and of course, beautiful singing of Mnohaya Lita! The evening was left to explore Times Square, experience a Broadway show or grab a slice of pizza and do some shopping on 5th avenue! On July 19, we will be performing in Philadelphia at the KleinLife Theatre! This concert is going to be very unique as we have not one, but TWO special guest choirs joining us on stage! As the show is in 10 days, we wanted to give you the opportunity to learn more about Dzvin and Prometheus. We can't wait to share the stage with these talented choirs! Find them on Facebook and give them a 'like,' you won't be disappointed! DZVIN was born in March 2009, when several Ukrainian choral singing enthusiasts came together under the direction and leadership of Nestor Kyzymyshyn. That same year in December, DZVIN had the honor of performing for the Ukrainian Ambassador and embassy staff in Washington, D. C. and at the Mormon Tabernacle National Shrine in Washington DC at their annual International Christmas Carol Festival. DZVIN has performed at numerous Ukrainian festivals in the Philadelphia as well as throughout the United States and Canada including: Lehighton PA,Baltimore MD, Rochester NY, Yonkers New York, twice at the Soyuzivka Ukrainian Heritage Festival in Kerhonkson, NY, and at the Ukrainian Orthodox National Shrine in Bound Brook, NJ. In 2012, DZVIN participated in the first International Choral Group Festival in Philadelphia. 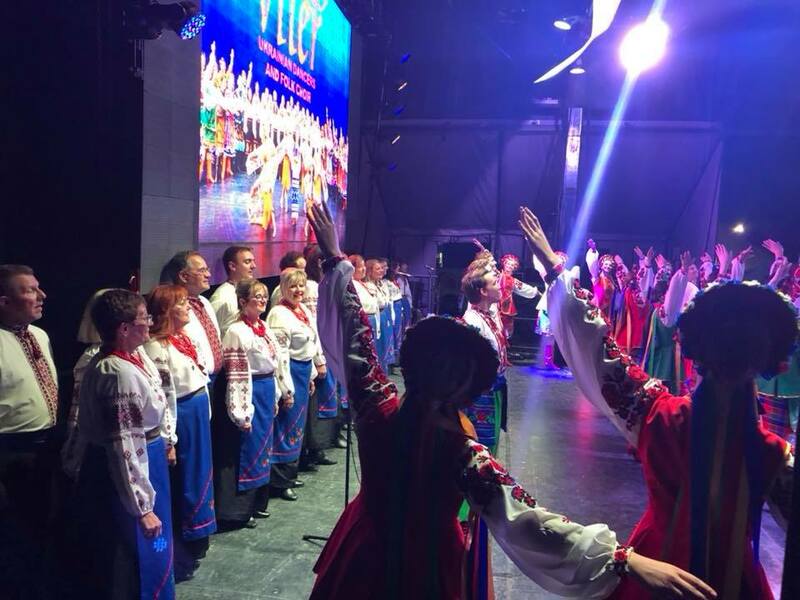 They participated along with choirs representing various ethnic groups residing in the United States including: Poland, Japan, China, the United States, Slovakia, Germany and Ukraine. In 2014, DZVIN had the distinct honor of performing at the Toronto Bloor Street Ukrainian Festival. In 2016, DZVIN was honored to perform at the Pysanka Ukrainian Festival in Vegreville, Alberta Canada. 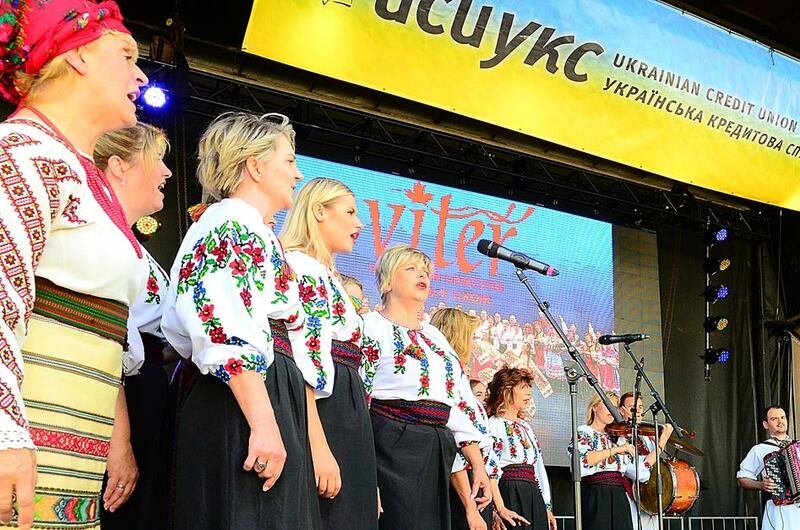 The choir sings traditional Ukrainian ballads, contemporary songs, humorous songs, Kozak Folk songs, UPA themed songs, religious hymns and the liturgy. DZVIN also sings at numerous weddings each year. Currently DZVIN is incorporating new songs into our repertoire, and we plan to continue performing at various venues in the US and Canada. There is even a rumor of a possible tour of Ukraine. The “Prometheus” Ukrainian Male Chorus of Philadelphia recently celebrated its 55th Anniversary. Founded in 1962, the Chorus has a long and distinguished history, which includes tours of Europe in 1980 and 1984, and Ukraine in 1995. They have performed at the Montreux Choral Festival in Switzerland, Carnegie Hall and Town Hall in New York, Mont Royale in Montreal, Roy Thomson and Massey Halls in Toronto, John Kennedy Center for Performing Arts and DAR Constitution Hall in Washington, and the Academy of Music in Philadelphia, among many, many other prominent venues around the world. Always striving for the highest degree of musicianship, “Prometheus” maintains a rich and colorful repertoire to enable audiences to experience the great beauty of Ukrainian choral tradition. Under the direction of Artistic Director Roman Kucharsky, and accompanied by pianist Irene Zwarych, the Chorus brings together a diverse range of male singers committed to musical excellence. They love to perform – and love doing it well! Минулого року, Український Чоловічий Хор “ПРОМЕТЕЙ” з Філядельфії відзначив своє 55-ліття. Заснований в 1962-му році, хор має довгу і визначну історію, що включає два широкі турне по Европі, в 1980 і 1984 роках, та по Україні в 1995 р. За свого існування, ПРОМЕТЕЙ виступав на Хоровому Фестивалі в Монтре, Швайцарія та в найкращих залях Північної Америки і Европи. Завжди намагаючись на найвищий музичний рівень, ПРОМЕТЕЙ зберігає багатий і барвистий репертуар, щоб уможливити слухачам оцінити велику красу українського хорового мистецтва. Під керівництвом диригента Романа Кучарського, та супроводом піяністки Ірини Зварич, хор об’єднує різноманітний склад чоловічих голосів відданих музичній майстерності. Протягом 55 років, наш хор здійснує свою нелегку місію носія і пропагатора української національної культури. Будемо і надальше! Привіт and welcome to our 2018 tour blog! Here we will be documenting our favourite moments from our tour this summer. Our Tour & Travel Directors have been working very hard over the past year to create a memorable tour for us, and we can't wait to experience it! On this tour, we will be visiting New York City, Philadelphia, and Ottawa. Stay tuned to hear about what we will be doing in each city! T-9 days until we leave - Only 3 rehearsals left! We will be writing about our favourite moments from our tour in this blog - Check back to stay updated!